This special Offer (code: 50gift) is good on any purchase at MemorableGifts.com. 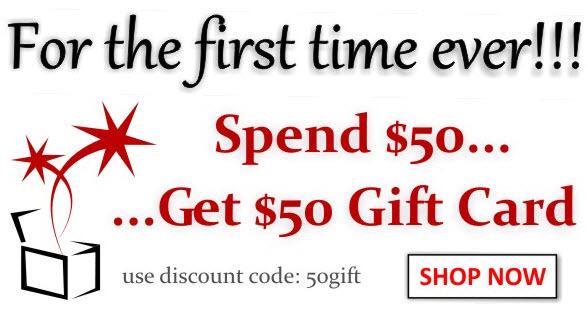 You will receive $50 gift code with your minimum $50 purchase. The $50 Gift Code will be emailed to you after your minimum $50 purchase is shipped. Please redeem your $50 Gift Code within 90 days at MemorableGifts.com online store with your minimum $100 purchase. There’s no cash value to the $50 gift code. This offer can’t be combined or used in conjunction with other offers. Nor can it be applied to previous or pending orders. One $50 Gift Code will be issued per customer.